With the number of commercial ROMs now available and the ability to program your own ROMs for the Wiard/Blacet Miniwave, I decided to build a PCB to allow the Miniwave to access a total of 10 ROMS. My Miniwave's are mounted behind MOTM format panels which are available from Stooge Panels. I have designed the PCB to fit for this combination, although I believe it should work as well behind the Blacet Frac-Rac panel. 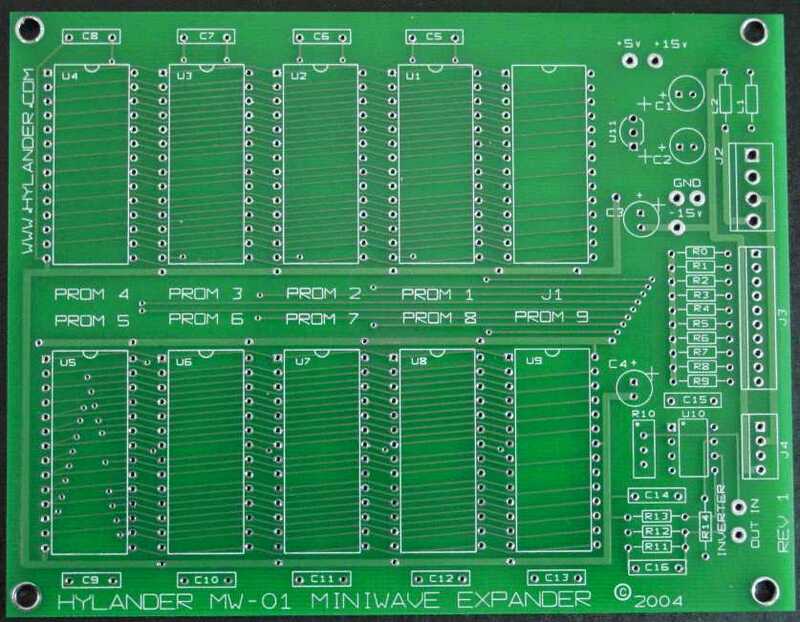 The Expander PCB is 4.2" x 5.45", solder masked, screened, and has mounting holes which will align with the mounting holes on the Miniwave, allow mounting by use of threaded standoffs. The expander has locations for ten 28 pin DIP sockets, nine for ROMS and one which is the connection point to the Miniwave via a 28 pin IDC DIP plug and ribbon cable. The cable will plug into "A" ROM socket on the Miniwave board. 15V power is supplied to the board via a MOTM compatible .156 header and is regulated on board to +5V. Power consumption for a fully populated board in analog switching mode is 7mA. ROM switching is accomplished by use of either a rotary switch, or decimal thumb wheel switch, or with use of an add on daughter board, CV. I choose to use the thumb wheel switch, which allowed re-use of the existing Stooge Miniwave panel. Originally I had planned to use a BCD switch with a BCD to decimal decoder. I abandoned the concept as I was not happy with the durability of the BCD thumb switches available, and suffered some erratic behavior in the design. The new release Rev 1 of the Expander eliminates the BCD section, and adds an inverter opamp circuit instead to allow a -OUT output from the Miniwave. The Expanders are back in stock! There are some slight revisions including a -15v rail and header to power Larry Hendry and Scott Juskiw's CV ROM Switching daughter board, bypass caps for the ROMs, an additional bulk capacitor for ROM power, and correction of the silk screen for the +5v regulator. As I mentioned above, I have also added a opamp which can be used to invert the output of the Miniwave. Due to supplier price increases the cost for the boards will be $40 US plus $5 shipping via Priority Mail for shipments within the USA. Shipments outside the USA may incur increased shipping costs based on location. I can also supply an assembled, tested ribbon cable with the DIP28 plugs on each end, plus a Mill-Max DIP28 screw machine socket to adapt into the DIP28 leaf socket on the main Miniwave board at $10. I have found that DIP28 plugs do not reliably stay connected into leaf style sockets as supplied with the Miniwave. The solution to this, other than removing the original socket (not recommended) is to insert a screw machined socket into the leaf socket, and then plug ribbon cable DIP28 plug into the added socket. I have given my proto unit a fair amount of vibration abuse and the DIP plugs stay secure into the screw machined sockets. Here is a picture of the new PCB. Pictures of the completed module using a decimal thumb wheel switch and the original Expander. I have designed a Stooge panel for rotary switch selection of the ROMs. It is listed in Larry Hendry's Stooge panel section of his site. Here is the panel design.  I will most likely design a new panel for the upcoming panel run, which will include the -OUT jack. As I mentioned above, Larry and Scott have designed a small daughter board which allows CV switching of the ROMs. There is a panel available for this version as well and can be seen here. The PDF parts list and assembly instructions for the Rev 1 Expander are here. The PDF schematic for Rev 1 is here. The JLH-2090CV is a daughterboard for the Expanded Blacet/Wiard Miniwave. The JLH-2090CV adds voltage controlled switching of ROMs on my ROM expansion board and an inverter for providing an inverted output from the Miniwave. The ROM selected is indicated by LED, and the board has a jumper for setting the number of ROMs installed in the Expander, so that a empty socket can not be selected. I have purchased the licensing for Larry and Scott's CV2090 daughter board and they are available from me. You can find detailed information on the board at Larry Hendry's website. Scott Juskiw also has some constuction notes and pictures at his website. Here's some pictures of a 1U add on CV Expander module for use with a Frac-Rac Blacet Miniwave or other Frac sized system. Payment can be in the form of Paypal by using the Paypal Cart Buttons below. I can also except money orders and personal checks. Contact me for mailing address for these orders. If ordering from outside the USA, please contact me for shipping charges. Please do not ask me to mis-represent the value of the shipment for customs documents on orders shipping out of the USA. Now that you have sockets for 10 ROMS, what to fill them with? Matthew's ROMs have not been available for some time. He has granted me a temporary license to burn and distribute his ROMs. More information here. I am currently working on several ROMS which will be offered for sale in the near future. These include PPG Wave samples, Allophones, and some others. I do have two ROMS by Grant Richter available which he has given permission to sell. The first, GR-PPG/VS is a combination of waves form the PPG Wave and Prophet VS. The second, GR-NEW is the file NEW.256 which Grant includes with the download of the Wave256 program. Shipping for ROMS is $5.00 for any number of ROMS ordered separately from an Expander. If ROMS are ordered with an Expander, the ROM shipping is included in the Expander shipping cost. Some of you may want to develop your own waves utilizing Grant Richter's Wave256 programming software, but do not have the means of burning a ROM. If you would like to email the Wave256 file you wish to have burned, I can do this for you at a cost of $20 per ROM. Shipping is $5.00 per order. Please do not ask me to copy other available commercial ROMS for you. Please email me if you wish to have ROMS burned. I am not a licensed Electrical Engineer. This project is offered as a DIY (Do It Yourself) project. Assembly and use of this PCB is at your own risk. My MOTM has suffered no ill effects from the introduction of this board, my house has not burned down, and my wife and cats do not seem to be effected as well. Dave Brown built a nicely done Miniwave and Expander in .com format. He does a great job with silkscreening his own panels. Check it out here.